I’ve still been paddling, but with my daughter home from school and her birthday it’s been a couple really busy weeks. As my long, Saturday paddles build in distance I’ve been challenged finding new places to go where I can be on the water longer than 6 hours. A couple of long river paddles were organized and then fizzled but a very experienced, new kayak acquaintance showed me some wonderful places this past week in a couple of rivers. Here’s the San Juaquin River. Since the CR100 is in a river I’m trying to spend my last month of training; well, training in a river. 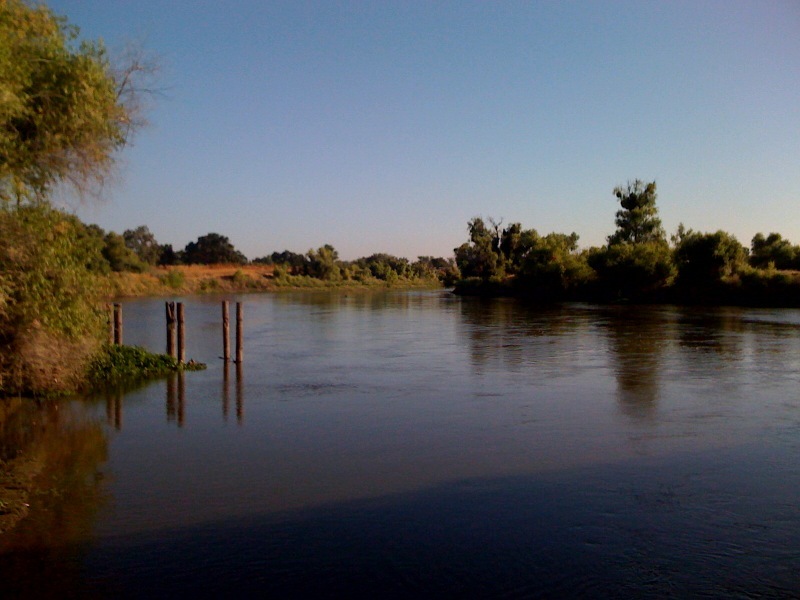 It’s also probably going to be 90º plus during the race, so getting to these rivers in central California provides me with hot, river conditions. So this last week, one day, I did some river reconnaissance and was lucky enough to paddle 22 miles in two rivers, the Stanislaus and the San Juaquin. The plan was to go up current on the Stanislaus but we met an un-portage-able set of rapids about 2-1/2 miles upstream. Luckily where we put in, the San Juaquin ended at the Stanislaus. We turned around and went up the San Juaquin instead. It wasn’t so different paddling upstream than some of the tides in the bay. What was different was that the water was so calm and smooth, no boat traffic, and we saw less than 5 people all day. We hit a little wind on the way back, but nothing like the higher winds we’ve been having in the bay this year. And heading back to the start is all with the current. Really fun, and psychologically helpful when you’re tired towards the end of the day. I took this weekend off from paddling, but I’ll be back on the water Mon., and all next week. I’m going to head out on the San Juaquin next weekend shooting for 30 miles. I’ll probably be solo again, but it was sure nice spending a lovely day on the water with my new friend. Thanks Wayne! This entry was posted on July 24, 2010 by DummyDiva. It was filed under Uncategorized and was tagged with Colorado 100, kayaking, outdoors, paddling, San Juaqin River, Stanislaus River, training.